Financial services consumer engagement specialist, The Wisdom Council (TWC), has today published research results from a study that looked to get under the skin of critical issues with the long-term savings market. The report, supported by BlackRock, HSBC, Standard Aberdeen, St. James’s Place, Investec, Columbia Threadneedle and PIMFA, reflects both the insights from conversations with customers and the results of a wider quantitative survey conducted with over 2000 UK individuals. The study included some retirees, but chiefly covered generations who have yet to reach the traditional retirement phase to understand how well they are rising to the savings challenge. Misconceptions are rife. Around 40% of millennials in TWC’s study think they have a defined benefit scheme that will pay them a pension in retirement when the latest ONS data suggests that less than 1 in 5 under-29s have an element of a final salary pension. Knowledge and understanding around existing pension arrangements are woeful. Awareness of tax relief on pensions is still very poor across generations – only 1 in 5 recognised this as a feature of workplace schemes. Customers are crying out for education, but it needs to be timely, relevant and engaging to have meaningful impact. The gender pay and pensions gaps are exacerbated by a lower propensity amongst women to invest outside their pension, greater lack of awareness and lower levels of confidence in their financial knowledge. The industry still isn’t reaching disenfranchised women. The value of taking greater risk for greater returns is understood by around half of respondents, but risk aversion is alive and kicking – though many consumers are taking unintended risk through their reliance on cash or their family home as a store of wealth. Most see the equity in their property playing a critical role in boosting their income in retirement. Lack of trust remains a concern. There is still an element of mistrust of financial services generally and of successive governments who have moved the retirement goal posts. Despite the pressure on cost of living and savings, over 60% still expect to retire by their 60’s. Nevertheless, 38% do see full retirement happening beyond 70, perhaps suggesting a rising expectation that retirement will not be an immediate event, but rather a period of transition – sometimes referred to as the ‘grey glide’. Particularly reflective of the qualitative phase of the research, the term ‘pension’ is seen by many as an out-dated term. Anna Lane, CEO of The Wisdom Council says: “We see growing differences in life stages between generations and shifts in retirement patterns. The ‘grey glide’ is the new reality – have manufacturers caught up with the need to refresh and innovate to allow that flexibility? We think there is more to do on that score and our study raises some of those questions. perception that both are ‘safer than pensions’ is evident from the qualitative conversations and comes through very clearly in the wider study. The reliance on property equity is a concern. 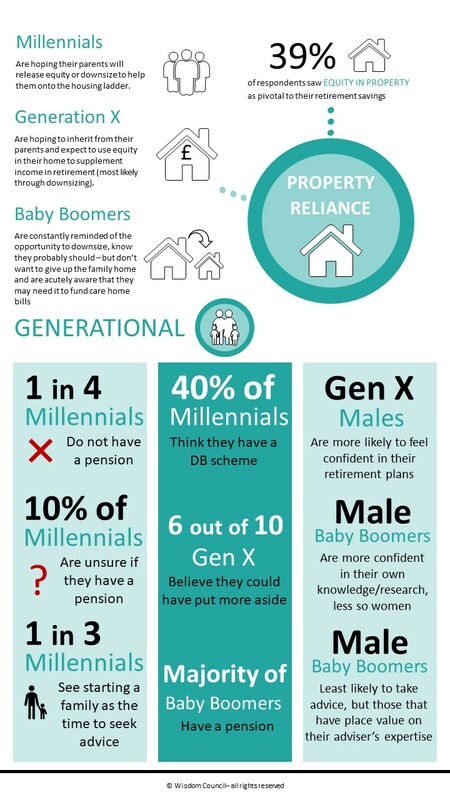 1 in 4 millennials (many of whom are struggling to get on to the housing ladder in the first place) are banking on property equity to boost retirement savings. Millennials still wary of the financial system and traditional big banks after the credit crunch – and struggling under a mountain of debt. Generation X were initially unsettled by the pensions mis-selling scandal of the 90’s and haven’t seen anything to restore their faith. Baby Boomers stung by endowment shortfalls and feel that the industry hides behind obfuscation and a wall of words. 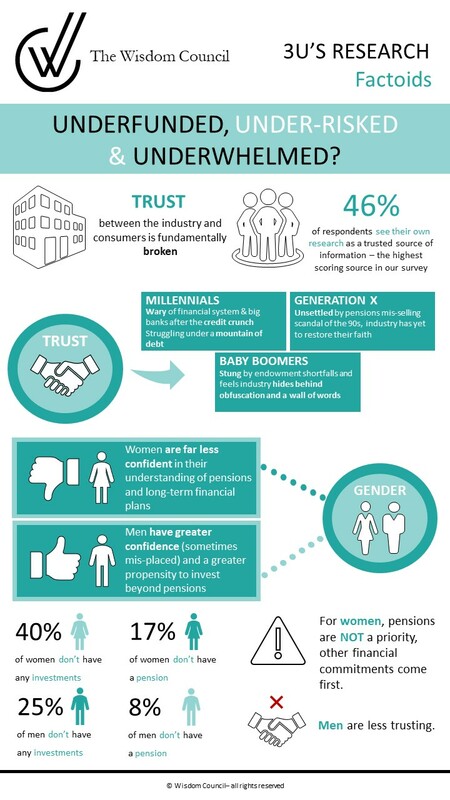 There is limited trust in finance specialists as a source of information with almost half (46%) preferring to do their own research, particularly men (49%) and older generations (57%). Less than a third (33%) cited financial advisers as trusted sources of information and only 17% cited online savings or investment services. For those open to taking advice, expertise of the adviser and complexity of pensions are the main drivers. When it comes to pensions there is a clear difference between genders. Two fifths (40%) of women, versus 25% of men, said they had no investments at all. Many women cited their pension as not being priority, with other financial commitments being more front of mind, such as a mortgage and children. Men appeared to be more confident (not always necessarily well-placed) in their understanding of pensions and long-term financial plans. Baby Boomers (aged 55-74) – The majority have a pension, with men expressing greater confidence in their knowledge and own research, less so women. Older men least likely to seek advice, but those that have place value on their expertise. Generation X (aged 35-54) – Men more likely to feel confident in their retirement plans. Though most likely to feel they started saving too late with 6 out of 10 saying they could have put more aside. Women most pessimistic about their pension lasting. 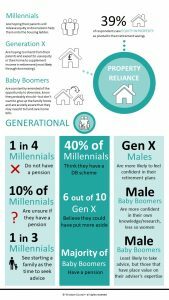 Millennials (Aged 18-34) – 1 in 4 don’t have a pension and 10% don’t know whether they have one. They are more likely to reject pensions or other long-term investment because they want to live for today. However, they are more receptive to technology solutions such as ‘robo’ advice. A third see starting a family as the time to seek advice. Millennials are hoping their parents will release equity or downsize to help them onto the housing ladder. Generation Xers are hoping to inherit from their parents and expect to use equity in their home to supplement income in retirement, most likely through downsizing as they near retirement. Baby Boomers are at an age where they are being constantly reminded of the opportunity to downsize and realise they probably should – but don’t want to give up their family home and become painfully aware of care costs through the experiences of elderly friends and relatives. To access the factoid please click here. The Wisdom Council is a customer engagement specialist, bringing intelligent insight to financial services firms and helping them to shape strategy, propositions, new product development and service delivery. We believe improved engagement with clients is critical to the future success of the financial services industry. The Wisdom Council team has long-standing experience of working with wealth and asset managers, drawing on deep technical knowledge as well as expertise in client engagement. Anna Lane is founder and CEO of the business.